After traveling down through the Mekong Delta on a speed boat, we reached the Cambodian border for a whole new side of our adventure to begin. The Kingdom of Cambodia holds a thread of pristine white coastline and an interior of emerald jungles. It has a quirky charm and a history that will move you. But in my opinion Cambodia’s real treasure is their people. There is widespread poverty, pervasive corruption and yet the people are still all so kind and friendly. Another bonus is everything is so cheap – accommodation, food, transportation and activities. If you are looking for a budget friendly but wonderful holiday destination, you found it. You will most likely spend more on cocktails or massages than everything else put together! As an Australian I was able to purchase a 30 day tourist Visa on arrival for about $30USD. (US Dollars are the preferred currency in Cambodia). Make sure you have a passport sized photo with you and at least 6 months on your passport. Phnom Penh, once known as the ‘Pearl of Asia’ is a bustling business and cultural hub with a wild west ambiance and dusty streets. There are a few good attractions to see but it was essentially just a quick stop on our way to Sihanoukville. Therefore we spent most of our time poolside, drink in hand or at a rooftop bar a few storeys up. But most of all we were eagerly awaiting the main reason for our entire trip, KaZantip! 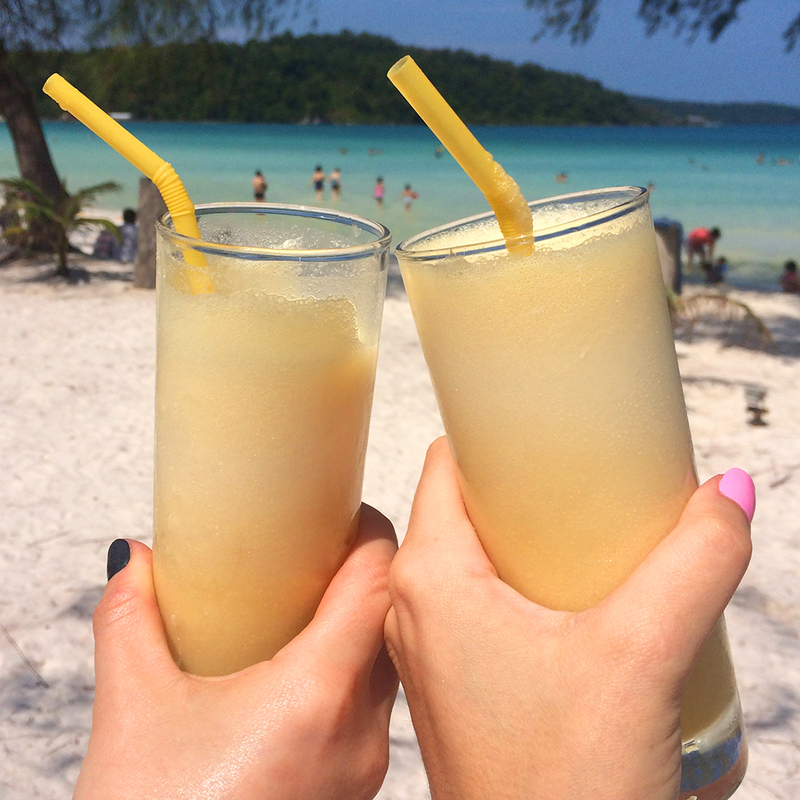 Surrounded by a coastline of white sandy beaches and sun drenched islands, Sihanoukville is a favourite for many travellers. 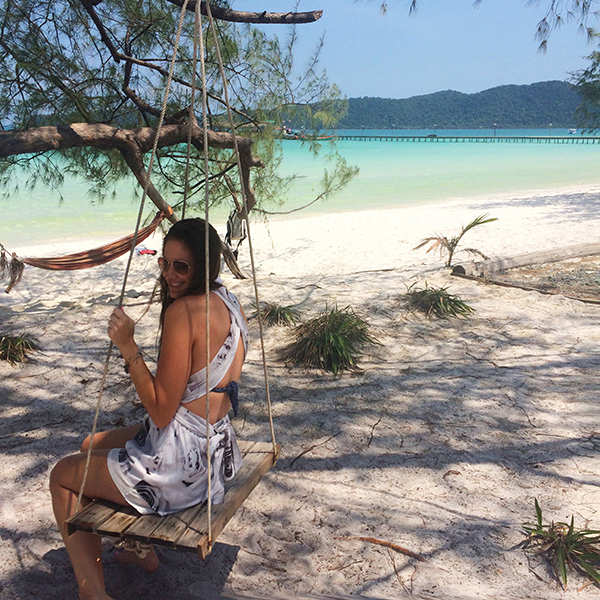 It is considered Cambodia’s top beach and resort area and has everything you need for a fun and relaxing trip with nearby deserted islands, great diving, amazing seafood and a thrilling nightlife! We travelled to Sihanoukville for KaZantip festival, a 9 day, 20 hour a day music festival across 10 stages and that year to be held on Koh Puous island. KaZantip looked extreme! There are wedding ceremonies, extreme sports, clothing is optional.. it was going to be wild! Unfortunately, every day we checked on the start time and every day it was promised that tomorrow the adventure would begin… But Cambodian authorities built a fence up blocking the bridge to the island. No one was allowed access across. So, never to waste a moment, we hired 2 scooters between us and visited the bars along Serendipity and Ochheuteal beach, spent our meals going through Moon Shack 1, 2 and 3 and Nathan and I went for daily massages, requesting a longer one every time (sometimes even twice a day). 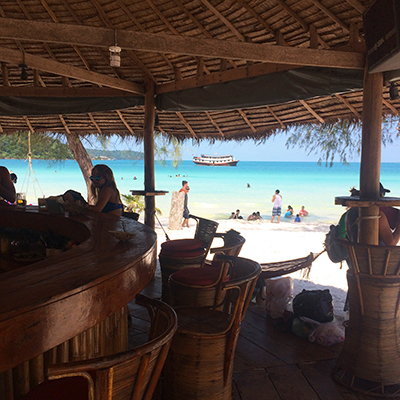 By far Sihanoukville’s most popular beach, this rocky strip has plenty of bars and restaurants here, with waves lapping just a few metres from the tables. However the beach is quite polluted and the constant flow of people and local vendors does interrupt the serenity. At one of the massage parlour visits we bumped into a group of Russian tourists who also had come for KaZantip. They informed us that they had moved their celebrations to Otres Beach in the meantime. Known for its cleaner waters and (usually) quieter crowd, Otres Beach is a strip of rather swish boutique resorts. The mellow scene here ticks all the boxes if you’re looking for lazy days of sunbathing rather than night-time bar-hopping. Well, usually! The influx of Russian tourists had transformed the night! Spent the day at Otres Beach as we heard thats where many russians were staying. The Kazantipers were partying up a storm! It was such a great atmosphere and everyone had the best time. We danced all night! There was podium dancers in alien costumes and the djs from the festival were playing! As Kazantip still hadn’t started we planned a day trip. We were collected from our guesthouse at 9am and driven down to the jetty in a tuk tuk. We jumped aboard the Sihanoukville party boat which has three floors and an area on the top deck for sunbathing, with padded sunbeds and floor cushions to lie on. It takes a couple of hours to get to the island, but in the meantime they serve lunch and make a stop for people to jump off the plank into the gorgeous ocean below and have a swim. If you suffer from motion sickness then I suggest you take something before you go because the boat tends to sway a lot. I had to keep quite calm and and focused not to be sick. And I was one of the lucky ones! There were many people on-board who got very sick, more so on the return trip. 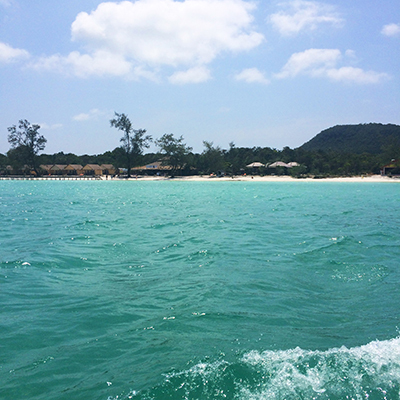 When we reached Koh Rong though, all thoughts were replaced by thoughts of the stunning view! It is truly breathtaking. The best beach I have ever seen! Growing up in Brisbane, Australia I’ve seen some amazing beaches, but this is a whole other level! 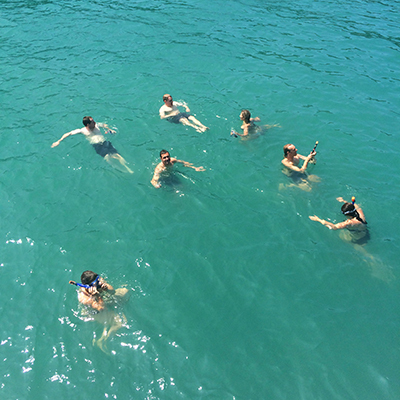 There was no pollution or rubbish, water as clear and as far as the eye can see. Not to mention the silkiest white sand I’ve ever walked on. Definitely add it to your must travel list! ~ This was the same trip as my visit to Vietnam. For sure i will come back here 🙂 nice photos, text and i general HIGH CLASS!